Was that a stick that just moved? If it's a walking stick, then yes. 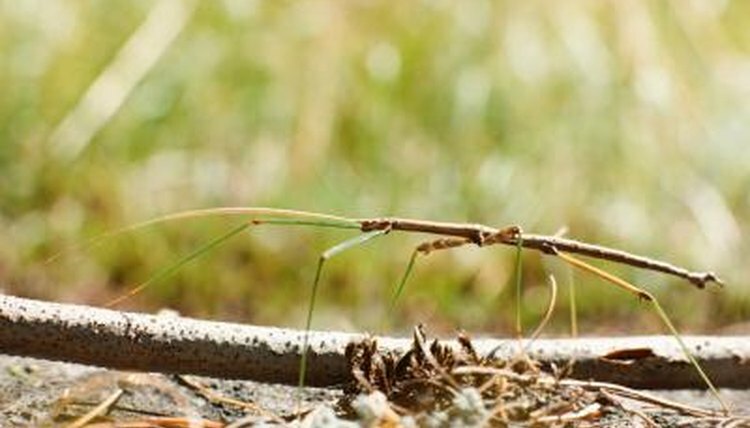 Walking sticks are six-legged insects with chitinous exoskeletons. They belong to the same family as grasshoppers, katydids, crickets, praying mantises and cockroaches. They're easy to keep as "pets," especially when it comes to feeding them. While walking sticks will feed off green vegetation -- ivy, some shrubs like the privet, raspberries, various plants and other vegetables -- they love lettuce, which makes it easy for you to keep these insects as pets. John Locke, an associate professor in the department of biological sciences at the University of Alberta, Canada, recommends feeding Romaine lettuce, especially the green part. Throw away the white basal stalk. Rinse and remove any bad spots on the lettuce before feeding. Depending on how much the insect has eaten and the quality of the leaf -- fungus is bad, Locke suggests feeding walking sticks every three to seven days. Change the lettuce and the liner -- the bottom paper that lines the jar or whatever you're keeping the walking stick in.